Scopac’s “Scopac Lite” and the Cley Spy Mulepack go head to head in our Scope Carrier review. There’s no denying that a spotting scope can add a tremendous amount to your wildlife viewing enjoyment. For years I managed without one, but since getting my first one (an old Kowa acquired second hand through eBay) I certainly wouldn’t be without one. In some situations it’s either impossible or undesirable to get closer to your subject… and that’s when a decent spotting scope really comes into its own. Your scope gets you closer to the action, lets you ID distant waders across a muddy estuary, pick out the blows of distant fin whales from a headland and watch a family of foxes playing without affecting their behaviour. The extra magnification afforded by your scope opens up a raft of new wildlife watching opportunities, and reveals a level of detail in your subjects that can be truly breath-taking. But all of those benefits come at a cost – and I’m not just talking about the potentially hefty price-tag of quality optics. Scopes and tripods are heavy and cumbersome combinations. Carrying a setup around for any length of time is a real pain in the… well, in the shoulders and arms for a start. 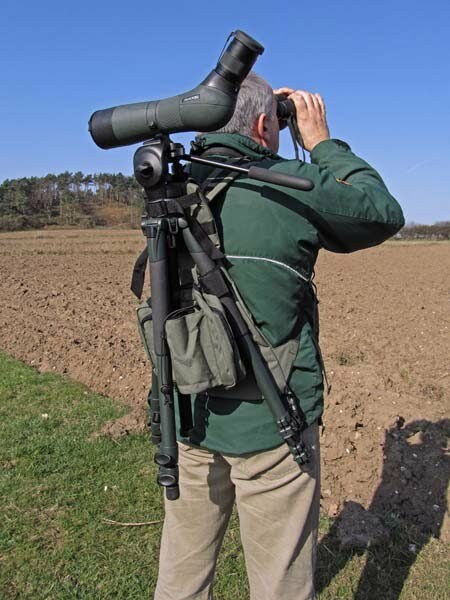 It’s also incredibly inconvenient if you’re out looking for wildlife, because when you’re carrying your scope you don’t have your hands free to use your binoculars. If something unexpected heaves into view (as so often happens) by the time you’ve put down your scope and grabbed your bins you’ve already missed it. Both the Scopac Lite (made by Scopac) and the MulePack (made by Cley Spy) offer a very elegant and functional solution to the problem of carting your scope and tripod around. Superficially the two are very similar products. Both of them are made from strong, durable fabric and attach to your tripod to provide backpack-style transportation with scope / camera attached. Summary: A functional, comfortable scope carrier that is good value and offers an elegant solution to carrying your scope around. Detachable “Digipac” offers limited storage in a single zipped compartment when attached. “Mesh” back ensures good airflow but sacrifices storage potential. The first thing you notice when you unpack the Scopac Lite is that it really is very light… which is a real plus when you’re attaching it to something as potentially weighty as a scope / tripod combination. The second thing you notice is that it’s very robust and well put together. The Scopac feels like it’s built to last, which is always a plus when you’re taking gear out into the field in all weathers. Fixing the scopac to the tripod is very straightforward, if a little fiddly. Just follow the instruction sheet included, attach the various straps to the relevant parts of your tripod and you’re good to go. Once attached the whole set-up feels very stable and secure. With multiple anchor points there’s no danger of your precious cargo slipping. The Scopac makes carting a scope and tripod around very easy. Just grab a strap, throw it on your back and off you go. The padded straps are comfortable, and the integrated chest-strap adds stability and extra comfort if you’re planning on walking any distance. I could feel the tripod legs occasionally pushing on the sides of my back. It wasn’t really an issue when testing the Scopac, but I couldn’t shake the feeling that it could become one during extended use – like a hike out to a headland or up a mountain, for example. It’s definitely an order of magnitude better than carrying your scope over one shoulder, which was the way I used to manage. Removing the scope and setting it up for use is dead easy too – just slip it off your back, extend the legs and you’re good to go – you can be on your subject and enjoying great views in seconds. On the storage front there’s no denying that it’s limited – the included “digipac” is small, but there’s enough room for a small field guide, a pair of gloves and a few snacks and there’s an elasticated web pocket for a small water bottle on the side. You’ll need somewhere else to store your coat, spare fleece and any other gear you want to take with you though. All in all the Scopac is a very accomplished product and well worth a look if you’re looking for a convenient and comfortable way to cart your scope and tripod around. Summary: A refined scope carrier that’s so comfortable you sometimes forget that your scope and tripod is there. Lightweight but very strong and durable with an excellent quality finish. Storage options include a relatively large integrated zip-up pocket and a detachable “field bag” for bits and pieces. The MulePack is also quite light, but feels a bit more substantial than the Scopac when you first pick it up. That’s down to the wider, more padded shoulder straps, a more elaborate detachable field bag and the integrated zip pocket that’s absent in the Scopac Lite (but is part of the Scopac Original design). There’s not much in it, to be honest… certainly not enough to notice when you’re walking around with a scope attached. How to attach your Cley Spy Mulepack tripod carrier to your tripod. As with the Scopac, the Mulepack makes it really easy to carry your scope and tripod setup in the field. One feature I really like on the Mulepack that’s missing on the Scopac is the little webbing “loop” on the top of the unit. This is good for hanging the Mulepack up out of the way, but is also incredibly handy as a convenient carrying handle for moving your scope a short distance, grabbing it out of the car, etc. It’s a small thing, but one worth mentioning. In use I have to say that I found the Mulepack the more comfortable of the two. While the Scopac was very functional and infinitely better than no scope carrier, the Mulepack’s extra padding and wider shoulder straps certainly gives it a slight edge in the comfort stakes. I also never felt the tripod legs on my back while wearing the Mulepack, which is going to be a bonus when using it for any length of time. The Mulepack also has an integrated chest strap to stabilise things, but also includes handy webbing “thumb straps” that you can hook your thumbs into to help stabilise the load on awkward terrain. It sounds daft, but it works. The Mulepack also scores slightly better on the storage front. The integrated zip pocket is a reasonable size. You could fit a light poncho / kagool in it at a push, or maybe a light fleece if it’s not too big… or your lunch. Bear in mind though that this pocket is in the back of the Mulepack – which is going to be in contact with your back. You wouldn’t want to put anything in there that will a) dig into your back in use or b) would melt if it gets warm (so using it as a chocolate store is out ). A bit of thought has gone into the design of the detachable field bag – the main storage area has two handy compartments for field guide and what not, and two web-pockets for keeping your bits and pieces organised. You could probably also fit a small lunch / some snacks in to keep you fuelled up when out and about. There’s another separate pocket that’s ideal for storing a notebook with little elastic loops to hold your pen / pencil, and an specially designed pocket for a water bottle. There’s no getting away with it though, if you’re out for a day in the field, in Ireland, where the weather can throw anything at you, then you’re going to need more storage for your coat, your gloves, your hat and all the other paraphernalia that’s part and parcel of getting outdoors in Ireland. On balance I really like the Mulepack. It’s comfortable, easy to use, practical and well made. While I’d be happy using either product, after my experiences with each the Mulepack just edges it for me. While the benefits of using a scope carrier like the Mulepack or Scopac are manifest, there’s no getting around the one major drawback. Where do you put the gear you need for a comfortable day in the field if you’re carrying your scope and tripod on your back? I’d normally carry my lunch, coat, a spare fleece, hat, gloves field guides and all the other bits and pieces I’d need in a small day pack. But now I can’t carry it conveniently, because I have a scope-carrier on my back. 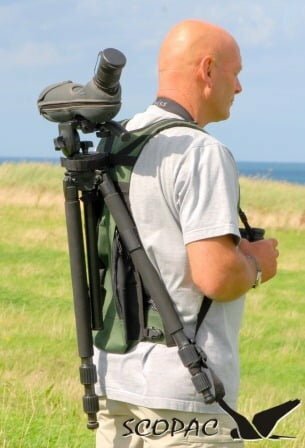 Maybe an “over the shoulder” style “man-bag” is the answer… which brings me conveniently to the other downside: people wearing scope carriers look more than a little bit ridiculous! That said, they really are brilliant at what they do, and make carrying a scope around a breeze rather than a chore. If saving backache is worth more to you than your vanity, and if you can reconcile the storage conundrum, then either of the scope carriers featured in this review is a worthwhile investment. If you decide you need something with a bit more storage – but a correspondingly heftier price tag — check out our Lowepro Scope Porter review for an alternative approach. Good review Calvin. Not used the Scopac one but I have been living with the Mulepak for a couple of years and it is very good at what it does. I love the way it leaves both hands free so if you need to climb a fence or wall or scramble up a hillside. On the down side the scope has clattered me in the back of the head a few times when jumping down off fences, so I now make that manoeuvre at a much more sedate pace! I’ll have to agree the “where to put the sarnies/water/guides” is a bit of a problem – maybe one of those shiny new LowePro rucksacs with the tripod holder is the answer?